Spieth dominates the Tournament of Champions field! Did this weekend’s Hyundai Tournament of Champions result remind you of what another player of fifteen years ago would do to a field of pretty good players? Jordan Spieth won the first tournament of 2016 in a dominant manner that is reminiscent of what Tiger Woods used to do. There wasn’t a doubt to the outcome. One player was head and shoulders better than the rest. In a sport where there are slight differences between the top players and the 100th player in the world, it is extremely rare that one player will distance himself from the rest of the field. We might be witnessing that type of player in Jordan Spieth. It may be too early to start comparing Jordan to Tiger, but it is hard not to. Jordan played the 2013 season on sponsor exemptions and soon earned his Tour Card due to his high finishes. In his 23 starts, he won once and recorded nine top 10 finishes. In his next season he recorded no wins, but eight top 10 finishes. 2015 was truly his breakout year, winning 5 times and fifteen top 10 finishes out of 25 starts. In 1996, Tiger earned his Tour Card by winning two of the eight tournaments that he entered. The next year at age 21, he won 4 times out of 21 starts including one major. Jordan turned 21 on July 23, 2014 and before his birthday in 2015 he won the Masters and the U.S. Open and two other PGA events. At the same point in their careers, Spieth has one more major title and the same amount of PGA victories that Tiger had at similar ages. Tiger’s career stepped into overdrive at age 23. During the glory years of Tiger’s dominance, he won an astonishing 33% of the tournaments that he played and thirteen major championships. That will be a considerable task for Jordan to duplicate or exceed. The similarities up to this point can’t be overlooked. Major championships, multiple wins and clutch shot making when others fail. Golf is tough and especially at the highest levels, so what Jordan is doing and what Tiger did make it compelling to watch and to cheer their mastery. Do I predict that Jordan will continue to dominate and surpass Tiger and beat Jack Nicklaus’s record of 18 major championships? 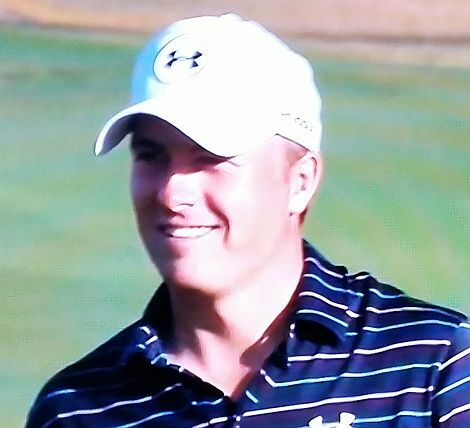 That is way too early to say, but what is evident is that young Jordan Spieth is playing golf the way the greats of the game played the game and that is very fun to watch.